You won’t even have to leave the resort to enjoy the slides and lazy river – the water park is right on-site! Three signature golf courses right on-site allow you to play like a pro. There’s nothing like coming back to your own house after a long day at the park. There’s no shame in take-out while you’re on vacation. Especially when the six on-site restaurants deliver right to your door. Your children won't be able to get enough of the water park, lazy river and children's club. 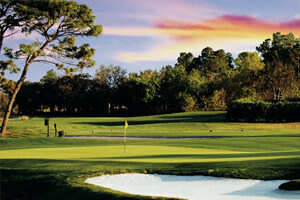 The resort has 3 championship golf courses on-site, designed by Nicklaus, Watson and Palmer. Relax as you float along the lazy river. You'll have a blast on the twisting waterslides at the on-site waterpark. Treat yourself to a drink at the pool bar while the kids play at the water park. Reunion Resort's Vacation Homes are conveniently located near Orlando’s best theme parks, shops, and restaurants. This private gated community has 24-Hour Security and all of the comforts of your own home along with the amenities of a 5-star resort. Reunion Resort features three championship golf courses designed by Tom Watson, Arnold Palmer and Jack Nicklaus. Get in touch with your inner-Serena Williams at the first class Tennis Complex with six lighted tennis courts. Stop by the Pro Shop or take advantage of a private lesson. There’s no shortage of fun for kids at Reunion. The two on-site playgrounds and Kid’s Camp are sure to be a big hit. But wait, there’s more! The multi-acre water park boasts both waterslides and a lazy river. They’ll spend so much time there you will begin to wonder if they are part mermaid. While the kids are busy at the water park, enjoy a little me-time at The Spa at Reunion. Treat yourself to a massage, facial, nail or body treatment. Custom spa packages are also available. Don’t feel like cooking? Dining options at the six on-site restaurants range from sushi to pizza and all of the restaurants offer room service straight to your home. Reunion Resort - Vacation Homes offer four-, five- and six-bedroom private homes all equipped with electronic locks – no hotel keys here. Four-Bedroom Homes sleep 8 to 10 guests, Five-Bedroom Homes sleep 10 to 14 guests and Six-Bedroom Homes sleep 12 to 14 guests. All homes feature full kitchens, fit for whipping up anything from a quick snack to a multi-course meal. Feel like going for a swim? Get changed into swimsuits, slap on some sunscreen and head for your private pool. Let the kids show off their diving skills while you work on your sun-kissed look poolside. Back in the house, spacious living areas have plenty of room for the kids and all of their toys, blankets and games. Flatscreen TVs with DVD players are perfect for family movie night. Bring favorite movies from home, gather everyone on the couch and ask for a show of hands to decide what to watch first: Toy Story or Finding Nemo? Snacks optional – but recommended. Washer/Dryers mean more space in your suitcase for souvenirs (you’re going to need it!) While the movie’s playing, throw in a quick load of laundry. Now all you have to do at the end of your vacation is unpack. Walt Disney World's® four theme parks and two water parks are less than twenty minutes from Reunion. Get started on filling that extra space in your suitcase at Disney Springs (formerly Downtown Disney). World of Disney, the world’s largest Disney character store, features stuffed animals, apparel, jewelry and toys. The LEGO Store will be a big hit with children and grown-ups alike. Visit the Pick-a-Brick Wall, get creative at the play tables and check out all of the Disney character models – built entirely of LEGOs. D-Tech on Demand has a large selection of merchandise for smartphones and tablets. You can even customize a phone case with your name. For the grown-ups, there’s Pandora Jewelry, Tommy Bahama, Kate Spade and Kiehl’s. There’s no shortage of food at Disney Springs. House of Blues serves Southern cuisine such as cornbread, gumbo, grits and jambalaya. Experience jungle-themed dining at Rainforest Cafe. Try the Jungle Safari Soup or Tribal Salmon. Little ones will love the Jurassic Chicken, Python Pasta and Castaway Pizza. There are two Starbucks locations in Disney Springs, perfect for getting your caffeine fix before heading back to the parks. Universal Studios and Universal’s Islands of Adventure – home to The Wizarding World of Harry Potter – are just over a half hour away from Reunion.